With a population of just under 2,000 people, the small town of Lyons, Colorado is known for its creativity, natural beauty and wide range of adventure opportunities. Lyons has been aptly called “A Bluegrass Playground”, a place where musicians come from all over America to perform for festivarians on the banks of the St. Vrain River at the legendary Planet Bluegrass. Elevation Outdoors Magazine named Lyons 2016’s Top Small Adventure Town for its dedication to outdoor recreation, including events like Lyons Outdoor Games, and activities like kayaking, tubing, fishing and seasonal ice skating. Nestled against the foothills of the Rocky Mountains, Lyons is the gateway to Rocky Mountain National Park, just a 30 minute drive up Hwy 34 to Estes Park. Lyons thrives on locally-owned small town businesses and restaurants, but is close enough to Longmont and Boulder (a twenty minute drive to the East or to the South) for access to big box stores. Lyons is home to Planet Bluegrass, a distinctive music venue on the banks of the meandering St. Vrain River, under the towering red rock cliffs at the base of the Rocky Mountains. Planet Bluegrass hosts two weekend-long world-class music festivals each summer — RockyGrass and the Rocky Mountain Folks Festival. These relaxed, community-based festivals have drawn in big stars over the years as well as local legends. 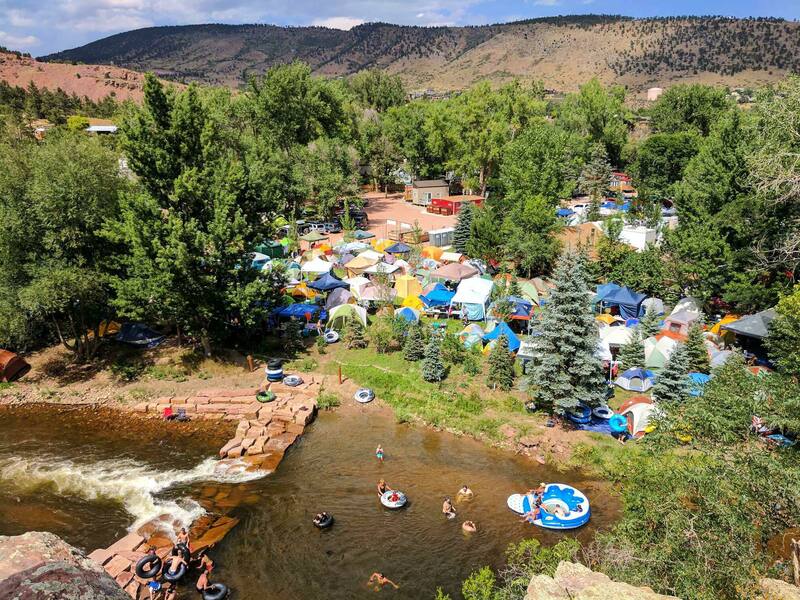 In addition to the amazing music, the festival goers (known as festivarians) enjoy delicious food, drinks, kids activities, shopping, camping, and of course, tubing down the St. Vrain River. Lyons also holds the Oskar Blues Burning Can Beer Festival at Lyons Outdoor Games – a weekend of beer, music, camping and outdoor adventure. The St. Vrain embodies the heart, the thrill and the charm that is Lyons, Colorado. The river has something fun for everyone. Simply relax on the banks, spend an amusing day tubing, do some fishing or, for more of a thrill, go kayaking! Lyons is locally famous for its perfect floating conditions for tubing and great access point. For a map of these access points as well as exit points, parking and safety info, click here. The St. Vrain is also a great spot for fly fishing during the summer months. Lyons also has a swimming hole, a favorite for local kids. True to its small town roots, Lyons’ quaint downtown is lined with locally-owned small businesses. Driving through downtown, you’re sure to notice unique art and sculptures from local artists on street corners and in parks. For entertainment, check out Lyons Classic Pinball — with 25 + classic pinball games from the 1960’s to the 2000s as well as video games from the 1980s. For eclectic gifts, Colorado arts and crafts, music from local musicians and more, check out Western Stars Gallery. Besides the vast selection of local shopping spots and restaurants, the downtown area is home to Sandstone Park — featuring sandstone masonry, a community stage, art murals and the Lyons Visitor Center. Uniquely accessible and friendly to all levels of hikers, the trails at Button Rock Preserve offer multiple routes, lovely riverside strolls and beautiful views. For an easy family hike, the riverside trail is flat and strollers as well as wheelchair friendly up the dirt dam road. For people who want a bit more of a challenge, continue up one of two trails from there to the reservoir. Another, more difficult alternate route is the 2.5 mile hike up Sleepy Lion Trail to the dam. In addition to the summer music festivals, Lyons hosts a ton of fun events throughout the year. In June, Lyons celebrates its history with Lyons Good Old Days with an outdoor community event featuring the Lyons River Run 5K, car show, food and beer garden, entertainment and live music. Throughout the summer, check out the Sandstone Summer Concert Series at the Raul Vasquez Community Stage in Sandstone Park. Click here for the 2018 Lineup. The Lyons community hosts a Halloween Spectacular, entertaining kids and adults with games, a parade through downtown as well as a chili cook-off and trick-or-treating. For the winter holidays, the Holiday Craft Bazaar features 60+ artisans with a variety of crafts and gifts. The Lyons Holiday Parade of Lights is an annual celebration in downtown that includes a parade, fireworks, and choir show. Every winter, the Lyons Polar Bear Club takes a dip in the freezing waters of the St.Vrain River, always drawing a crowd. Hungry after all that adventuring? Lyons has you covered. For breakfast, try the locally-loved funky cafe Stone Cup, serving up huevos rancheros, breakfast sandwiches and a full coffee bar. Kids and adults alike will love the mouth-watering BBQ & sides at Smokin’ Daves BBQ for a restful lunchtime stop. Date night in Lyons? Try Lyons Fork, offering “fancier” food like almond encrusted salmon and shrimp scampi in a fun, colorful, laid back setting. The late-night crew will not be disappointed at the original Oskar Blues, serving up fresh beer, homestyle comfort foods and entertainment like arcade games and occasional square dancing! Completely renovated after the devastating 2013 floods, LaVern M. Johnson Park features tons of fun equipment including a zip line, giant web swing, and yes – a splash pad! The park also has a shallow play stream for the kids to enjoy. The park’s covered picnic area was built for all seasons, with gas-powered fire pits and of course bathrooms for your convenience. An ice rink is available in the winter months. For those seeking a biking adventure, Heil Valley Ranch and Hall Ranch are beckoning. The trails in Heil Valley offer exciting obstacles, beautiful views and miles of bike-friendly paths. These trails extend from Lyons to Boulder. Hall Ranch covers a more mountainous terrain West of Lyons, with challenges for all levels of riders. Take a step back into Lyons history at the Redstone Museum. The building itself was the town’s original schoolhouse, built in 1881 with redstone obtained from the nearby quarries. The museum houses photographs, displays and genealogy records preserved by the Lyons Historical Society. Admission is always FREE. The museum is open daily June – September. The Lyons Dirt Jump Track at Bohn Park is an adventure park for bike riders. The dirt jump track features natural terrain and materials to mimic local trails and give riders a place to practice. The track is also the home for Lyons Outdoor Games at Colorado Burning Can Festival!